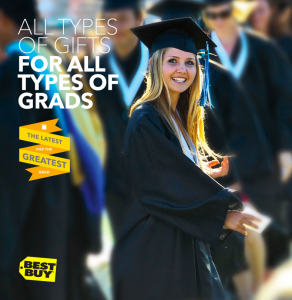 Best Gifts @BestBuy For Your #GreatestGrad!! One of the hardest things parents ever have to do is watch their the child move onto the next phase of their life when it comes time for them to “leave the nest” . It can be a stressful and overwhelming time when your son or daughter has graduated high school and is about to attend college in the near future. But more importantly, this should be a time to rejoice and be grateful that the most precious thing in your life is on their path to success. Preparing them for this journey is essential and there is no better way to do that than to make sure they are covered with all the tools and gadgets to make their life easier. That’s why Best Buy has your covered with all the greatest gifts for grads! What dorm room or apartment would be complete without some awesome, top-of-the line products from Best Buy? The LG Microwave + Pizza Oven and Frigidaire 3.1 Cu. Ft. Compact Refrigerator are two items off the top of my head that would make perfect gifts for any grad. Another great gift would be the Ninja Blender so they can make their favorite fruit smoothie before class! Or maybe they prefer coffee instead, in which case the Keurig Elite Single-Serve Brewer would be your answer. Now that we got some basics covered we can move onto their entertainment needs. The Samsung 32” Class LED 1080p Smart HDTV along with the Amazon Fire TV is a college students best friend. You can instantly stream your favorite movies, music or TV shows on your Hulu, Netflix and Pandora accounts. Every kid needs to be able to relax and take a load off after a long week of cramming for mid terms or finals. But even more important than entertainment needs, is their educational needs. No college student is prepared without the proper equipment. The HP Slate 7 Plus 7 Tablet is great way to have the internet readily available for when it comes time for those research papers. And don’t forget the HP Envy Wireless e-All-in-One Printer so you wont have to make any late night trips to the schools library to print stuff off. No matter what your needs, Best Buy has a huge selection of all the latest and greatest gadgets fit for any young adult ready to take the next step. Not only is the selection incredible, but the prices can’t be beat! Best Buy has a price match guarantee and offers an abundance of great gifts under $50!